Rakusan did not include the Fan Series in his main sequence numbering. Therefore, the original number used for each of the 36 Series prints has been modified to identify the Fan Series members of its theme. The five different fan silhouette shapes have been here assigned arbitrary numbers 1 through 5. To indicate a fan design these shape designations are added to the 36 Series number separated by a hyphen. 126-4 is the Fan Series design with fan shape 4 in the 126 Wild Camellia theme. Like all other designs in this series, 126-4 was only produced in a single print run, and few copies are currently documented. The 126 Wild Camellia theme is one of the many entirely regular themes represented by a complete fan quintet and a color woodblock print. On the delivery folio for installment eight of the Fan Series in November 1934, Rakusan announced theme 126 as due to appear in installment nine in the following month, December 1934. However, it is not known if the installment nine was actually distributed in that month or was delayed. The woodblock prints were likely printed during the same month as their distribution. On the folio Rakusan used the theme title 籔椿, yabu-tsubaki, 'wild camellia' (lit. 'thicket camellia'). Three of the five fan designs (including 126-4) and the 36 Series design 126 have seal C which indicates a carving date during the first half of 1934. Despite the early completion of those wooden blocks, Rakusan delayed printing and distribution of the prints in what became the 126 Wild Camellia theme at least for several months. It was eventually grouped with other winter season themes nearer to the end of the series. However, the other two fan designs have seal B which indicates a later carving period closer to the time of publication. At least some of the wild camellia designs in this theme were adapted from sketches originally created in the late 1920s during the planning of design 43 in the earlier 100 Series (see below). The composition of 126-4 includes a forking camellia branch with an open flower and a single bud. The leaves, flower, and branches have a light covering of snow. This design is less successfully executed than any of the other prints containing snow. Only some of the areas of snow have delineated boundaries. The others are simply an inconsistent halo of dots. The bounded areas of snow only look correct in the original sketch, but most of the elements as line drawings or areas of solid color also work as ishizuri. 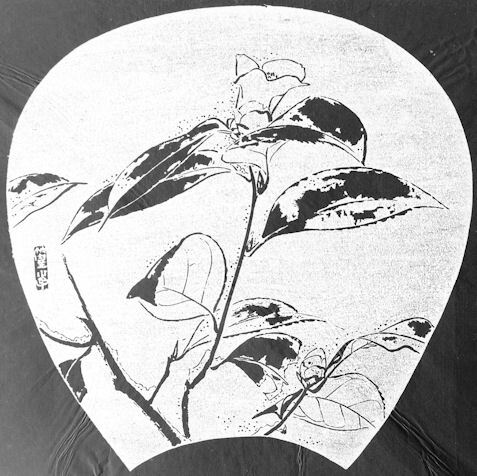 It is probable that 126-4 is an early design carved while Rakusan was still sorting out his ishizuri techniques. Japanese Camellia, Camellia japonica, 椿, つばき, ツバキ, tsubaki, has been extensively hybridized and selected to modify its flower form, habit, and blooming time. As the name implies, it is a Japanese native which still grows wild as well as in gardens. The original form is winter-blooming and often flowers covered in snow. For 43alt, 43, 126, and the related 36 Series designs shown below, Rakusan illustrates a small, bell-shaped flower of brilliant red which encloses a brush-like cluster of yellow stamens, which is the most common wild form. Rakusan calls this variety 籔椿, やぶつばき, ヤブツバキ, yabu-tsubaki, lit. 'thicket camellia', and it appears in more artworks than any other kind of camellia. It may also be called 山椿, やまつばき,ヤマツバキ, yama-tsubaki, lit. 'mountain camellia'. Neither of these names are varietal names but instead mean 'wild camellia'. 椿, tsubaki, is also used as a general name for any camellia. 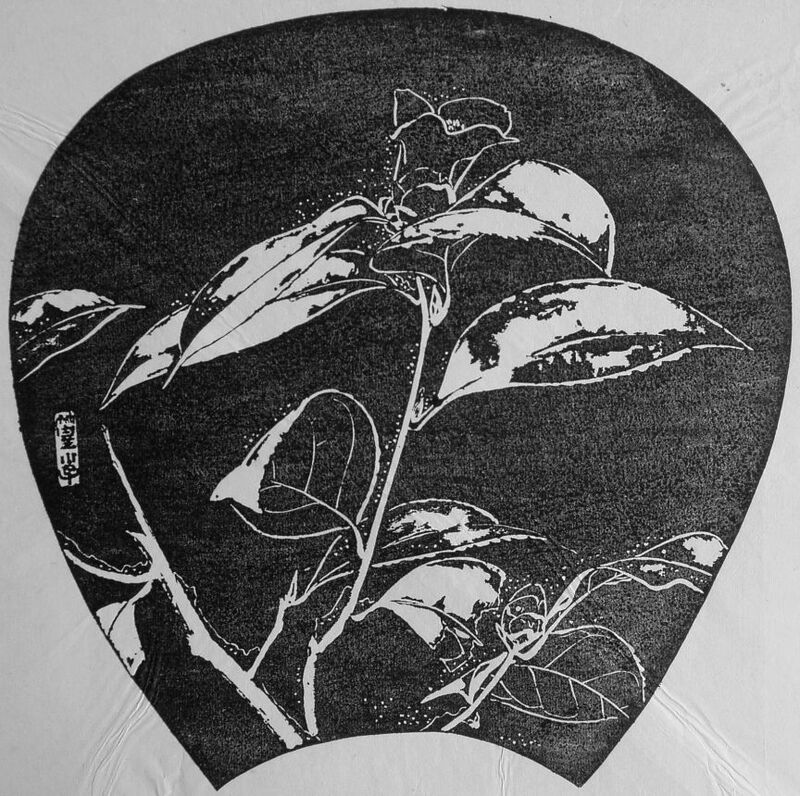 Although he had access to many varieties of camellias, Rakusan depicted only three different kinds in his woodblock prints, and examples each appear in the 36 Series. The other two kinds of Rakusan camellias are at numbers 116 and 129, which in turn link to their own additional related designs.